About 20 inches of snow that fell up until yesterday morning. In the high 50s today and 80% of the snow is already gone. Sure glad my patch prep was done a while ago. It is official. A new world record pumpkin. 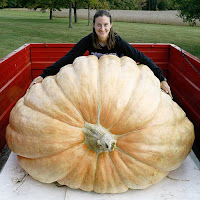 Christy Harp of Ohio grew the heaviest pumpkin ever put to a scale. The pumpkin weighed an amazing 1,725 pounds. Congrats to Christy and Nick on such an amazing feet. The pumpkin was grown from a 1385 Jutras seed. My children set a new personal best at the Arvada Festival of Scarecrows yesterday with a pumpkin the weighed in at 85.5 pounds. That beat last years pumpkin by 1/2 pound. They got a nice 2nd place ribbon, award certificate and $30 gift card for their pumpkin. It was a really cold day but we had a good time. My two kids grow a pumpkin this year together. This is Bode's first year. Their plant didn't have a leaf on it after the hail storm and even though it didn't get wattered for a week it rebounded over the course of a month and on August 31st they finally got a pollination. To look at the plant the end of August you wouldn't have known there ever was a problem until you took a hard look and saw a quarter of the main vine gone in a couple of places and some remnant thrashed leaves grouped in with the new leaves. In all the kids did very well. After growing just 40 days on only 100 square feet and only a couple of weeks of descent weather they have a pumpkin that tapes about 90 pounds. We will put it on the scale tomorrow at the Arvada Festival of Scarcrows weigh-off in Olde Town Arvada. Good luck kids! The pumpkin may be used by a professional carver at the Food Network's competition in Denver next week. Thad Starr was kind enough to let me stay with him on my trip to Oregon to go to the big weigh-off. 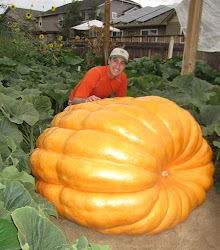 Thad had a beautiful orange pumpkin that he grew from his own 1528 seed. Also got a chance to meet and help load up the pumpkin of Dan Orleck on the trip who also had a great pumpkin grown from his own 1129 Orleck (985 Werner x 1041.5 Mckie) seed. Both of their families were super nice and I had a great time at the weigh-off meeting a lot of great growers.